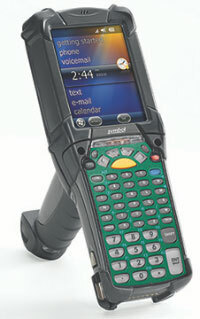 When you need to scan barcodes and collect data in the harshest of environments, the MC9190-G is ready for the job. Whether your workers are managing inventory in industrial warehouses, searching for materials in subzero temperatures out in the yard or repairing equipment on a military base in a hot sandy desert, the MC9190-G helps get the job done right and fast. MC9190-G90SWGQC6WR-KIT	 MC9190-G Complete Kit, Starter kit bundle that includes the PDT (Windows Mobile 6.5, condensation-resistant version, WLAN 802.11a/b/g, Bluetooth, 256MB/1GB Flash, 3.7" VGA color display, 2D Long Range Imager SE4600, 53-VT Key. Includes: all starter accessories	 Call for price. The Motorola MC9190-G90SWGQC6WR-KIT is also known as MC9190-G90SWGQC6WR-KIT	or MC9190G90SWGQC6WRKIT	.